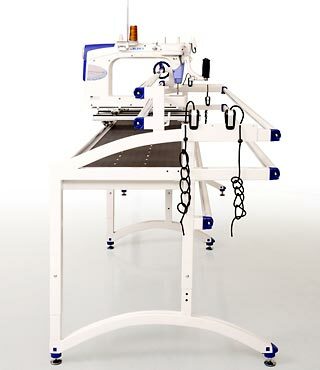 Quilters around the world have been waiting for a specialized machine like the TL-2200QVP. Discover the impressive 18 inches of horizontal throat space between the arm of the machine and the needle. 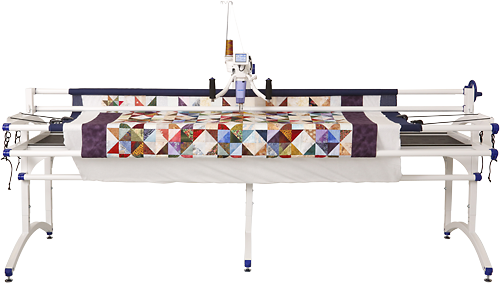 Even more impressive is the 10 inch height, unlike most long arm quilting machines which only provide an 8 inch height or less. 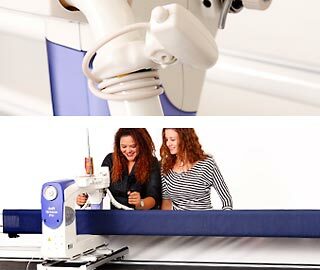 All this amazing capability is mounted on a deluxe 10ft Quilting Frame. By hand or software driven the Juki TL-2200QVP is a pleasure to drive for it's smooth and solid stitching over layered fabric and paddings. The Juki TL-2200QVP easily converts from a sitdown to a 5ft, 7ft, 10ft, and 12ft frame. 18” long x 10” high large workspace ensuring excellent quilting, handling and performance. Ideal for quilting your creative designs. The touch screen display indicates: Stitch Regulator Mode, LED Light Settings, Speed Control, Stitch Length, Needle Up/Down Position, and Automatic or Manual Thread Trimming. 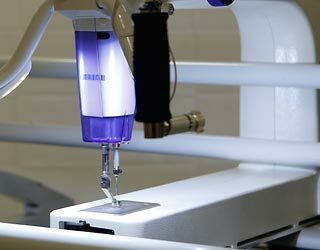 The stitch regulator makes it possible to produce accurate, precise stitching. 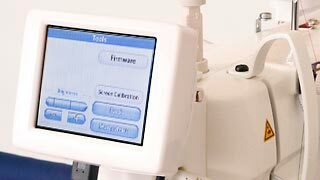 When you select your stitch mode, the TL-2200QVP communicates with the encoders to maintain perfect stitch length as you move freely over your quilt. Front Handle bars with padded hand grips can be adjusted to suit your personal needs. Adjust your handles horizontally, vertically or anywhere in between! This feature gives you a customized position for comfortable quilting from start to finish. Start or stop the machine with your right handle bar. Control the needle up or down position with the left handle bar. Gliding the TL-2200QVP over large work is a breeze. 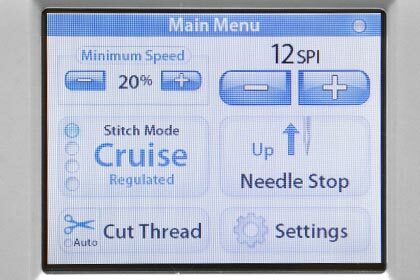 You can activate the up or down needle position for perfect stitching placement with either the left handle button or the LCD touch screen. The QVP’s bobbin winder operates with an independent motor. 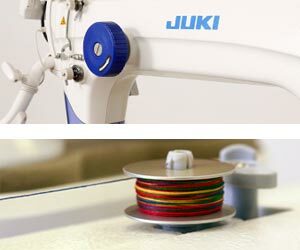 Full capacity M size bobbins filled with your favorite thread ready to complete your project. The adjustable laser light can be easily positioned to efficiently follow pantographs or patterns while quilting. 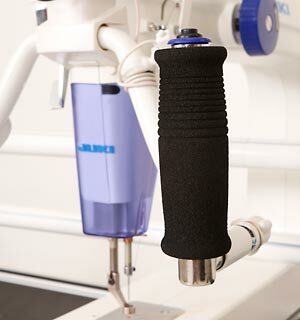 Direct drive motor allows for smooth, efficient operation while quilting Low Maintenance, with Hook Oiling when needed. Cruise, Precise, Manual, and Baste. 4 High intensity LED lights are located above the needle. An additional 6 ultra-bright True White lights directed on your stitching area. Rear handle bars for sewing pantographs or patterns are available.